With Readly you can read The Magic of Piers and thousands of other magazines on your tablet and smartphone. Get access to all with just one subscription. New releases and back issues – all included. From Southport to Skegness and Aberystwyth to Yarmouth, Britain’s seaside piers are a national treasure and a ‘must visit’ for anyone venturing to the coast. At last, here is a publication that tells their story, what inspired their designers, what attracts their millions of visitors and why their popularity has spanned generations, survived world wars and stubbornly stood against the battering of sea storms. Many are still vibrant and delighting visitors while others have gone, destroyed by fires, collisions or the sea... but are fondly remembered. These seaside structures have long been a gathering place for shows and amusements, populated by many British stage and comedy stars. The late Sir Norman Wisdom was one such icon, who said: “I used to like sitting in my dressing room when there was a high tide and you could hear the audience in one ear and the sea thumping against the pier with the other.” The Chuckle Brothers are also great pier fans, alongside fellow comedian Ken Dodd who has written the foreword for this publication. “The donkeys, the knotted handkerchiefs, the prom, the deckchairs that trap your fingers and the chips are all part of the great British seaside resort but the star attraction is always the pier where you can walk on water without getting your feet wet,” said Ken. There is a serious side to British piers too. During the dark days of war they stood firm and provided that extra advantage to the men of the Home Guard. Discover some of the more unusual examples too. Southend pier stretches out so far over the ocean that it has its own railway to help footsore visitors reach its end. Hastings pier once housed a zoo and Llandudno pier is so large it has two entrances. Each pier has its own story and is a unique attraction but they all share one distinction – Britain’s coastline would be a much poorer place without them. 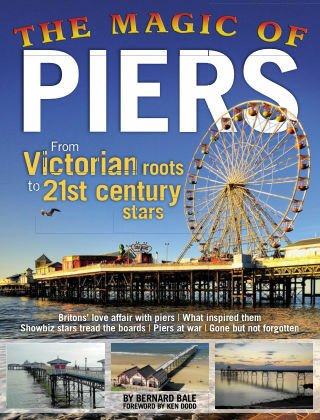 The remaining piers of the realm are a lasting tribute to this great gift to us from the Victorians, a classic British institution that challenges the ocean, epitomising the spirit of Great Britain – and puts so much fun into a day at the seaside.